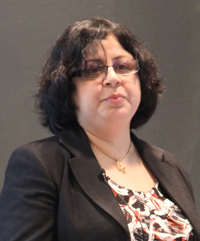 Urban slums in developing countries remain a “blind spot” for policy makers, but basic initiatives to empower women can have huge impacts on maternal and child health, Dr. Kiran Martin, founder of the Delhi-based Asha Society, told a BUSPH public health forum. ”Asha’s women’s associations have brought about remarkable transformation in slum communities,” said Martin, whose agency has been working in the slums of Delhi, India, since 1988. Asha works in partnership with 50 slum communities, helping 400,000 residents to gain access to healthcare, financial services and education through direct-service and community-empowerment programs. Martin described the early challenges of intervening in the urban slum community of Delhi, including meeting with resistance from slumlords, ”quack doctors” and local male leaders. The program’s focus is on empowering women, including training them as community health workers and midwives, and organizing them into associations to press for improved conditions. Twenty-three years later, Martin can reel off a litany of successes, some of them intangible and others measurable. Deaths from diarrhea, once a serious problem, are now extremely rare. The under-age-5 mortality rate in slum areas served by Asha is 28.2 [per 1,000 live births] — significantly lower than the average for Delhi as a whole. Nearly all Asha clients – 99 percent – who give birth have skilled attendants during delivery, compared to 47 percent in India as a whole. More recently, Asha hs helped to provide opportunities for dozens of children in the slums to go to college, and for families to receive loans and other financial-management resources from banks. The agency also has empowered slum residents to press for access to safe water and sanitation, drastically improving their overall health. Martin, who spoke at the invitation of BUSPH’s Department of International Health, said improving maternal and child health is not just a matter of opening health clinics, but of taking a “comprehensive approach” to improving a population’s quality of life. “Direct interventions require a supportive environment,” she said. Creating that environment means addressing issues beyond health care, such as access to education, employment, housing and micro-credit. Martin said intervening in urban slums is a different experience than working among the rural poor. Slum dwellers “are so used to being at the bottom of the pile” and to being sold “empty promises” by politicians, that agencies such as Asha struggle against an ingrained sense of fatalism, distrust and suspicion. Martin’s recommended remedy: form partnerships with the residents themselves, from the start, so that they become the agents of change. The agency itself becomes a facilitator. Jonathon Simon, chair and professor of International Health and director of BU’s Center for Global Health and Development, praised Asha’s work as an example of what a determined NGO can accomplish. He said the department hopes to work with Asha in the future to document and analyze the progress in health outcomes that the agency has achieved.